As it’s the school holidays, we arranged a weekday play date with Elliott’s big kor-kor friend, 10-year-old Zann and his mummy, Sophia. I’d heard a lot about ORTO and all the fun things to do there, but had yet to visit, so we decided to check it out. And luck was on our side, with blue skies and sunshine when we arrived at around 10.30 that morning. 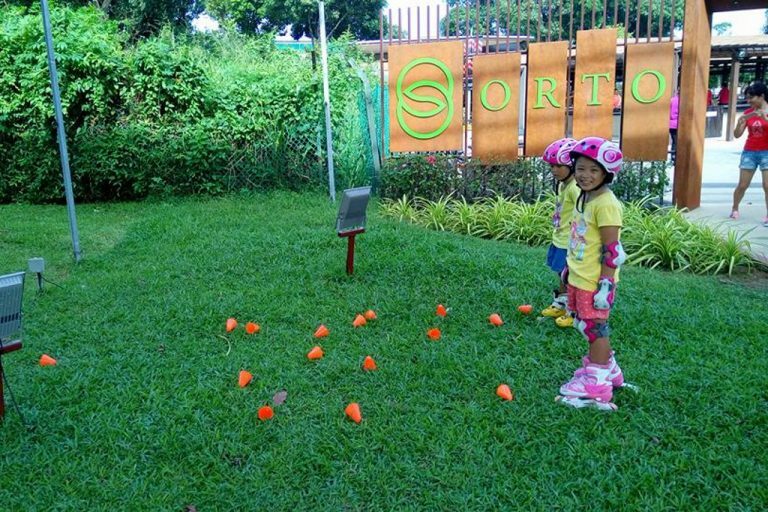 Our first impression was also the lasting one: ORTO is spacious, and packs loads of activities in one location. Best of all, we love the environment – lots of greenery, ponds and fresh air. 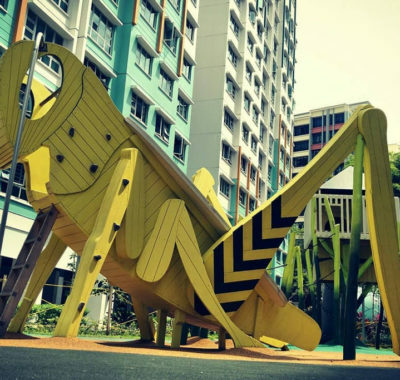 It’s a welcome change from all the air-conditioned indoor playgrounds, and we probably got a good dose of the sunshine vitamin too. We ended up spending a whopping seven hours there and there was so much fun to be had that Elliott didn’t even want to take a nap! We started the day at Katapult Trampoline Park. 2.5-year-old Elliott is at the stage where jumping is his favourite thing to do, so he was in seventh heaven. The layout is spacious, with everything padded so it’s safe even for littler ones. Marshalls are also posted all over keeping watch. 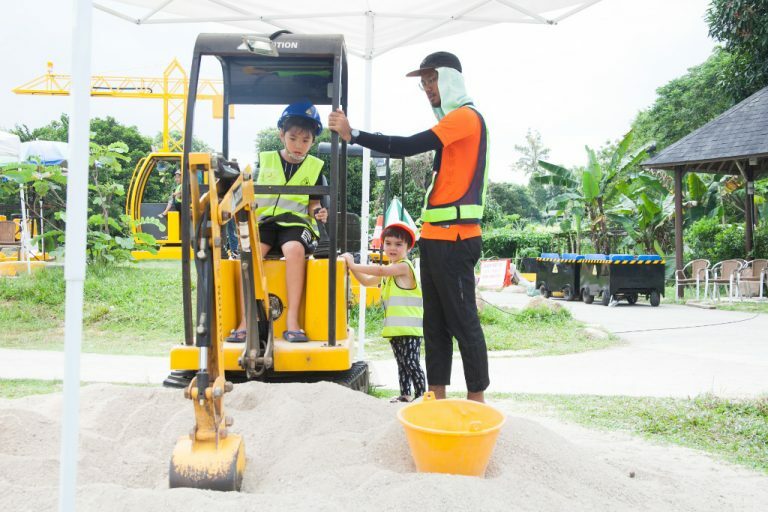 Most activities are designed for older kids, although there’s also a Kids Zone dedicated to the tots. But who wants to stay in a corner when there’s way more excitement to be had beyond? 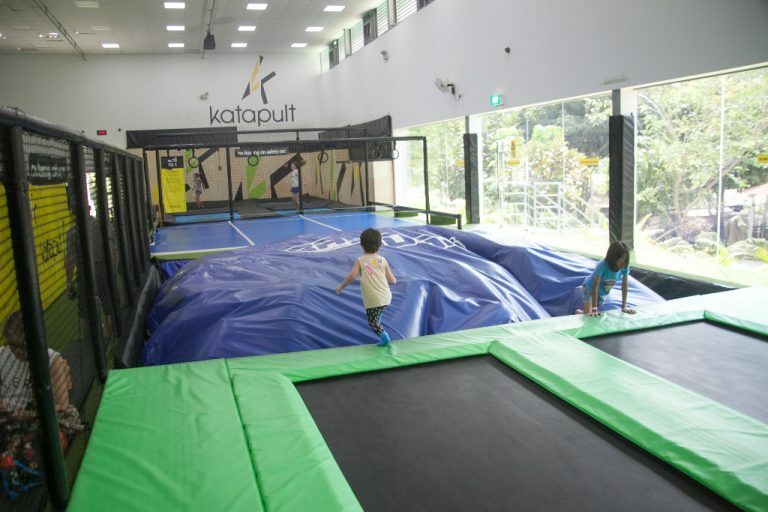 You can climb on padded walls and jump onto the trampoline in Wall Run, designed for kids at least 1.25m tall. Elliott was also a tad too short to reach the bars in Slack Line, and didn’t manage to bounce very far in Bag Jump, although he enjoyed trying to land on the huge inflated ‘bag’. Zann bagged a couple of nice dunks at Slam Dunk, and Elliott tried too, as he loves basketball. There’s also a Dodge Ball court that would be great for larger groups. 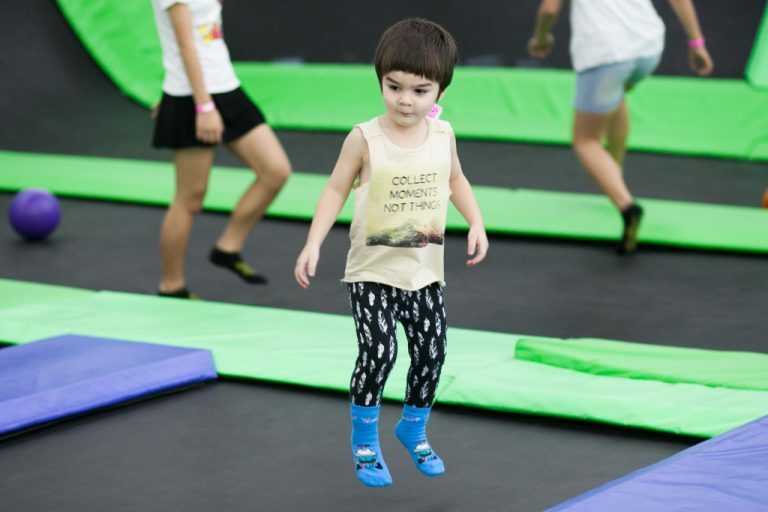 Tips: It can get quite warm in Katapult Trampoline Park, both from lack of air-conditioning and the constant bouncing, so remember to stay hydrated. Bring your own grip socks, or purchase a pair for $3. 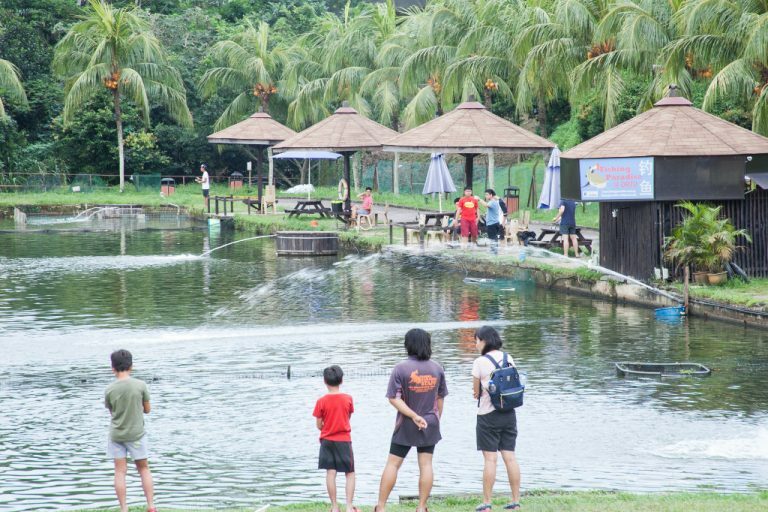 After an hour of intensive jumping, Longkang Fishing was the perfect way for the kids to cool off. 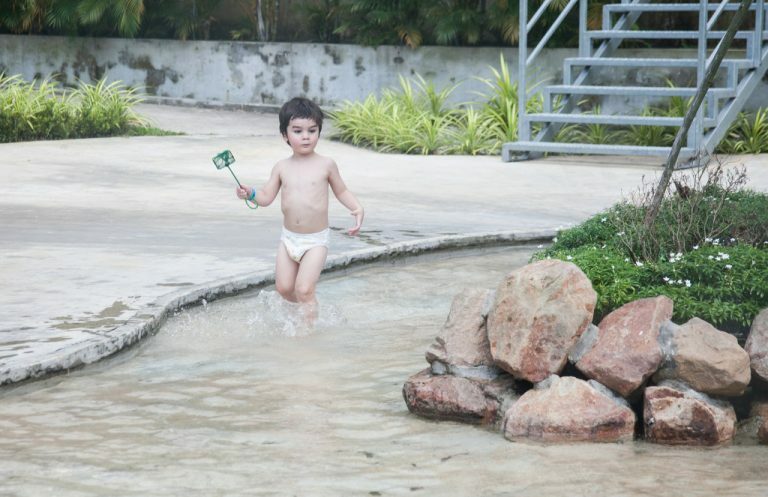 Each kid got a little plastic tank (that they can keep) and a net, and off they went, chasing after tiny guppies in the meandering river or ‘longkang’.I had decided to strip Elliott down to his diaper so that he could splash about to his heart’s content, which he did. Zann was an expert fisherman – he caught 12 guppies! Elliott attempted to catch some, but I think he probably terrorised them with over-enthusiastic smacking of the water more than anything else. There is no time limit, so we let the kids play till lunchtime. Zann wanted to bring his catch home initially, but we ended up releasing them into the pond after lunch. Tips: Purchase tickets at the Prawning counter on your way there. Bring sunblock and a change of clothes (there’s a toilet/changing room on site). We were all hungry by then, and discovered that we were spoilt for choice! We let the kids pick, and they decided on Taste Garden, thanks to a tempting photo of fish and chips on the banner outside. 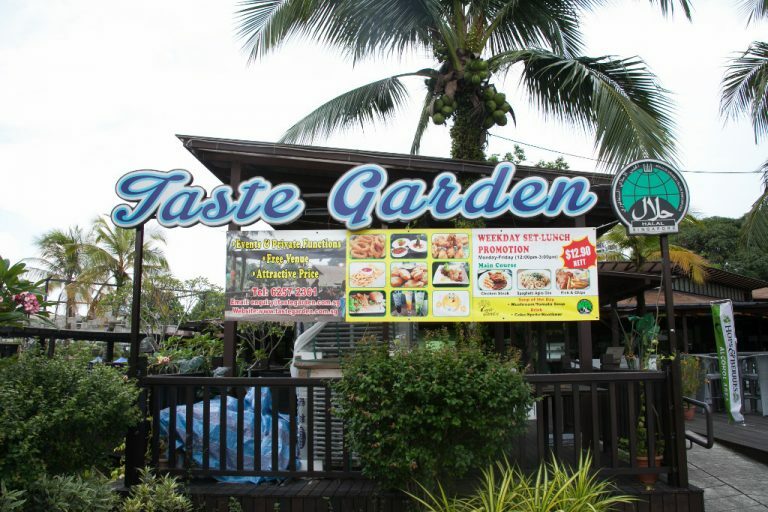 Halal-certified, it serves Western, Italian, Thai and Malay cuisine. It’s a cosy place with an air-conditioned interior, al fresco deck and super friendly staff. 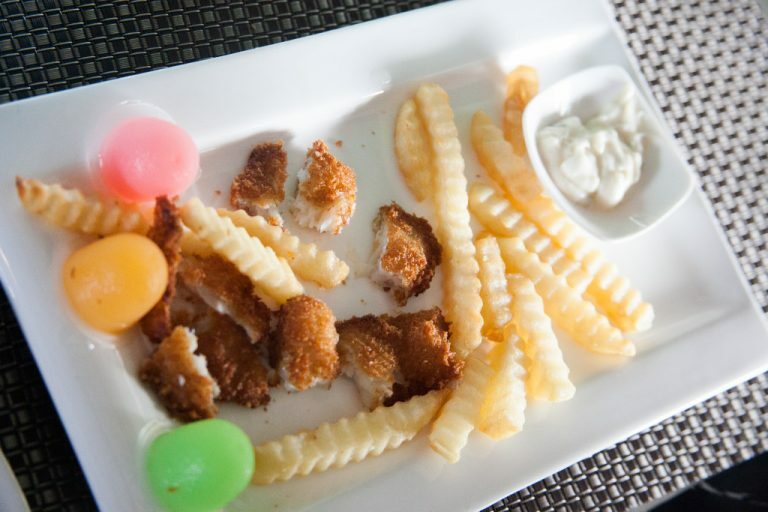 Elliott picked the fish and chips (shown above, already cut into bite-sized pieces) while Zann ordered the chicken chop, both from the Kids Menu, and their meals came with fruit juice and jellies. The adults enjoyed Pad Thai and Beef Rendang, and we also ordered sides: spicy chicken wings, calamari and the kids’ favourite, cheese fries! Tip: Scroll down to find out what other F&B establishments there are at ORTO. 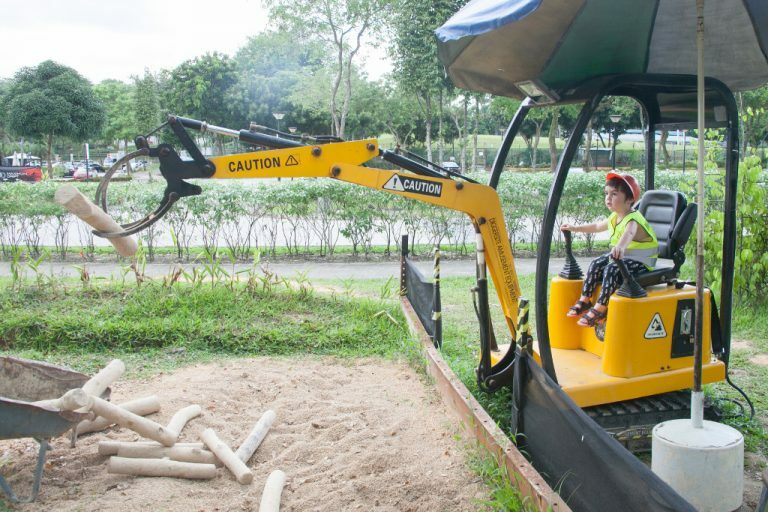 Stuffed from lunch, we found our way to the Diggersite ‘site office’ to purchase tokens for the rides. They also got kitted up, with bright yellow safety vests and coloured hard hats. Then their assigned ‘foreman’ led them out to the open-air construction zone. 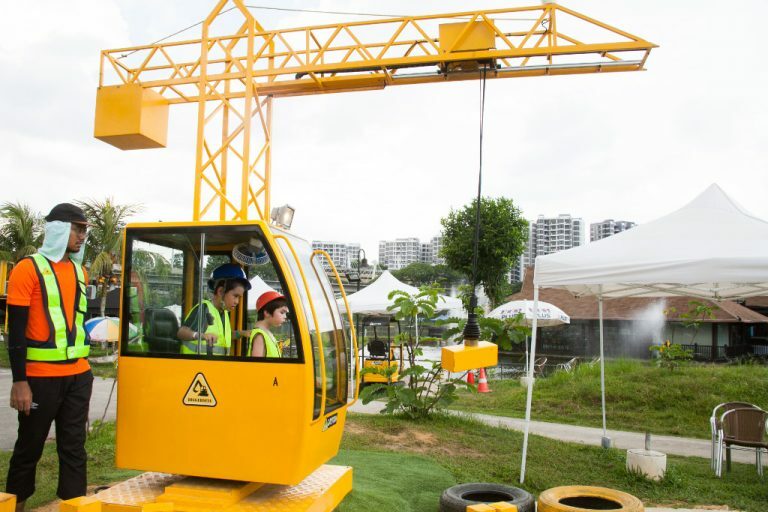 There are eight different machines to choose from, each with hydraulic arms designed to challenge different motor skills. Kids below six can sit on an adult’s lap, but Elliott had fun trying some out himself. He was also mesmerised watching Zann operating the machines like a pro. Both mummies decided that this activity was our favourite, and wish that the rides lasted longer – five or six minutes per ride was way too short! Editor’s note: Since we visited, Diggersite has moved from ORTO to a new location. It’s now located at Ground-up Initiative @ Kampung Kampus (91 Lorong Chencharu), which is right next door! Can’t wait to check it out! Tips: Bring sunblock and dress light. Walking shoes are probably a good idea. Next, we headed for Inline Culture, where Zann was looking forward to trying inline-skating for the first time. Unfortunately, the doors were closed, and although a sign said “Back in 15 minutes”, no one showed up. They offer rental of skates (with free safety gear), kick scooters and bicycles of all sizes. You can also sign up for a Fun-2-Skate Programme where you can go for as many learning sessions as you wish within 30 days. Tip: Call ahead of time (Tel: 6344 5522/9842 5522) to avoid disappointment. 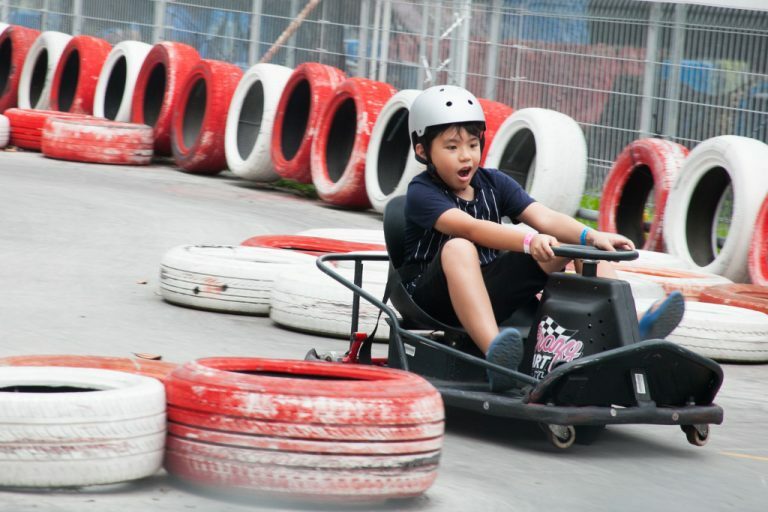 Although Zann was disappointed about not getting to skate, the Maximum Drift Karting Arena quickly put a smile back on his face. Racers have to watch a safety instructional video and don helmets before getting into their ride. Sophia decided to join her son for a friendly race around the track, as Elliott cheered them on. The drift karts weren’t as easy to control as they had imagined, and attempts to drift around the corners had them spinning 360 degrees! A light step on the accelerator can get you going at cruising pace. Step all the way down and you’re starring in your own Fast and Furious movie! Novice drivers should start slow and pick up speed as you gain confidence and control. There are no brakes; the kart slows to a stop when you let off on the accelerator. 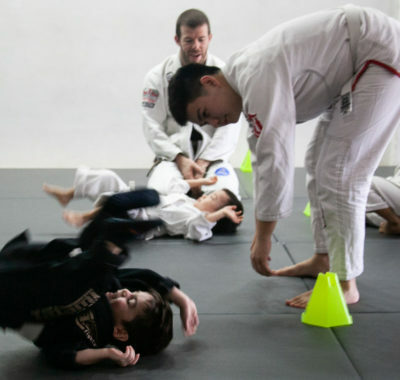 Each session lasts just 10 minutes, but it’s an adrenaline-pumping 10 minutes! Tip: Just remember, these aren’t bumper cars! 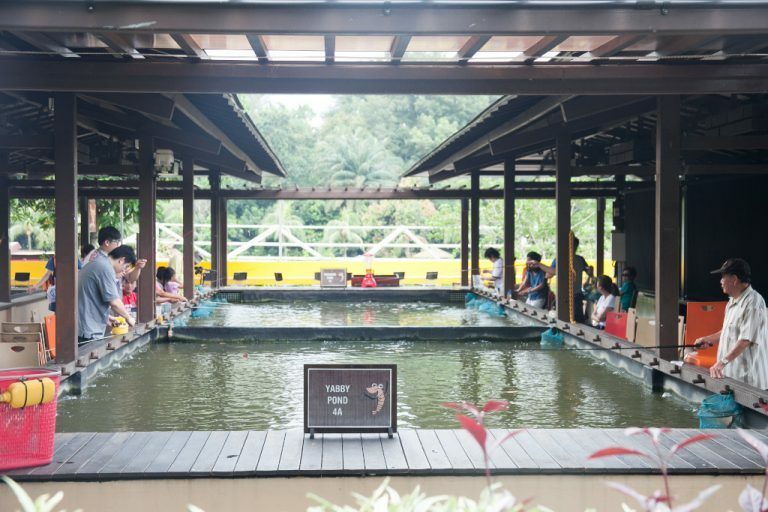 One of the biggest draws at ORTO is the huge and idyllic fishing pond at Fishing Paradise @ ORTO. However, as none of us are anglers, we gave this a miss. We did see several families enjoying some quality bonding time with their fishing poles. There are many different kinds of fish to be caught, and you can choose whether to catch-and-release, or bring your haul home for dinner. Another popular activity here is Prawning @ ORTO. We skipped this as well, partly because Elliott was getting too tired and grouchy after the long and exciting day. Again, there were many people around the 10 prawn and yabby (crayfish) ponds. You can even grill your catch on the spot! 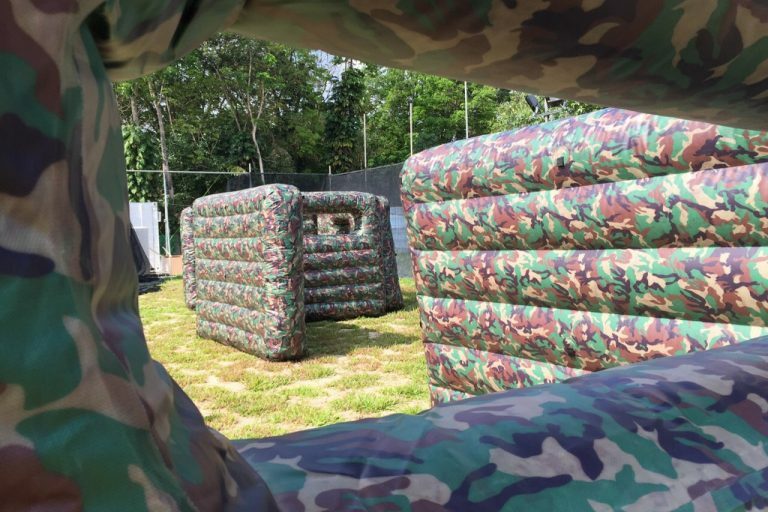 We also walked past the Red Dynasty Paintball Park – the paintball set-up was like an army obstacle course, except with inflatable structures. It looked like it would be a fun outing for a larger group of teenagers or an ideal team bonding session for adults. 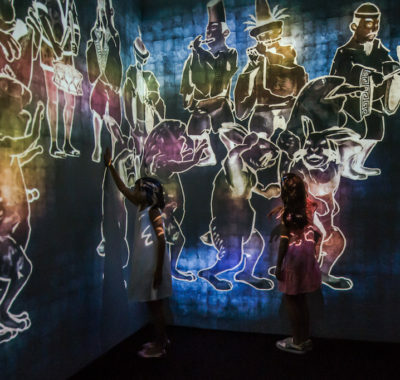 Last but not least was something that the kids would have loved, except that we were there on a weekday. 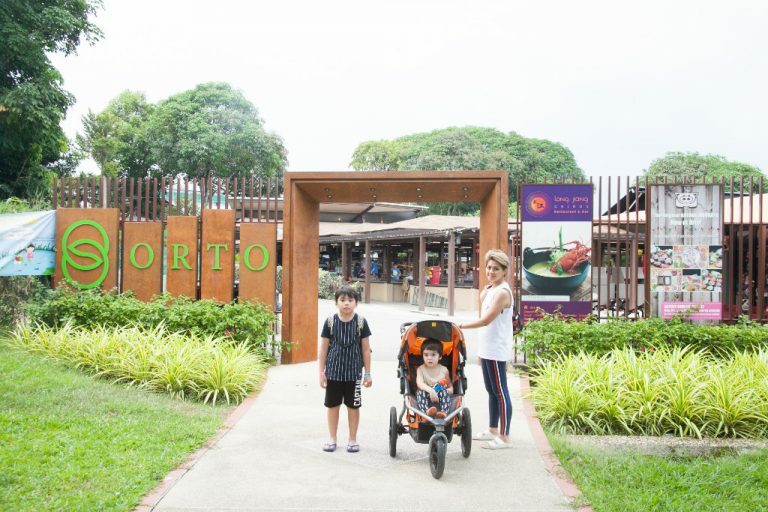 Featherhood Sg is a group of bird enthusiasts that gather on Sunday afternoons at ORTO to show visitors what their birds can do. 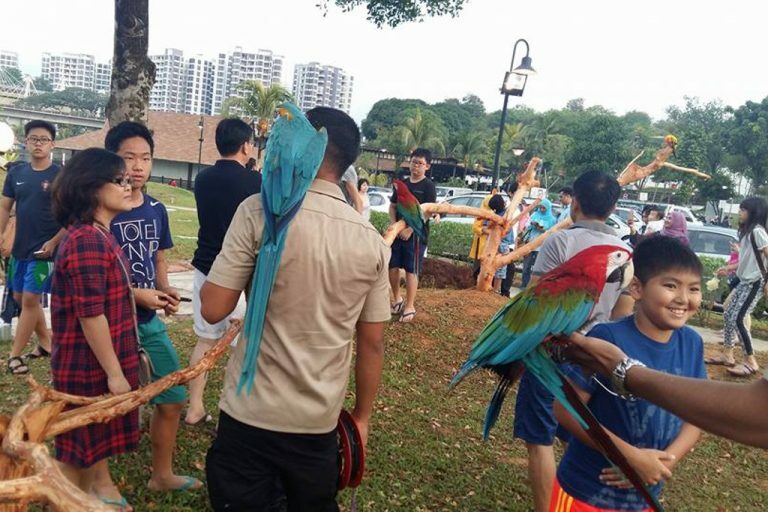 You’ll get to meet all kinds of feathered friends, even the large and vividly coloured macaws, and take photos with them. We plan to come back on a Sunday for this. There is a fair amount of walking to be done, so those with little tots might want to bring a stroller along. The entire place is pretty wheel-friendly, except for the stairs leading up to the entrance of the trampoline park. I parked Elliott’s stroller at the Longkang Fishing pavilion when we did that. Although most of the activity areas do have chilled drinks for purchase, you may want to bring your own drinks and snacks. We found ourselves wishing for a convenience store like 7-Eleven, or even an ice cream shop. That would be really nice for a midday break since it can get quite warm. 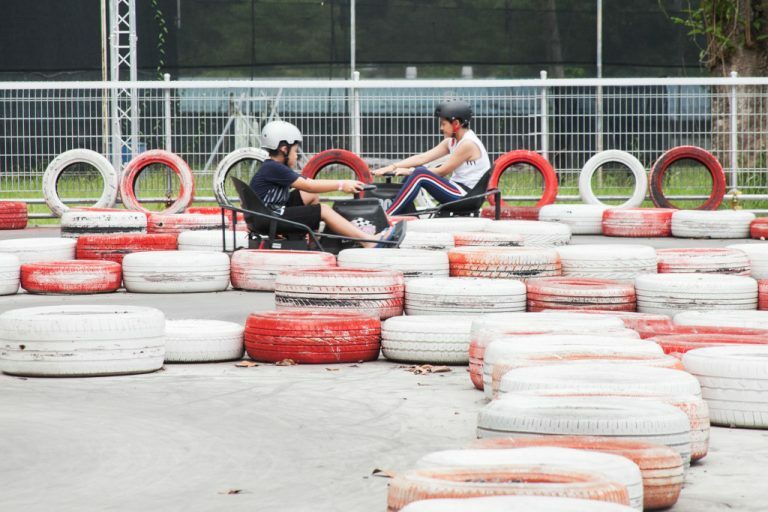 There is currently a special combo promotional price for the June holidays, where each kid pays just $18 for Longkang Fishing + Drift Karting (usual price from $30). Unfortunately, we didn’t notice the sign till after we had already gone Longkang Fishing.